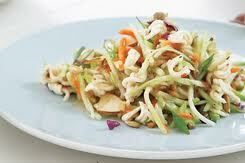 Combine broccoli slaw, green onion, sunflower seeds and ramen noodles. In separate bowl combine vinegar, oil, sugar and flavor packet and mix well. Pour dressing over salad and mix well. Refrigerate at least one hour before serving.